Innocent until proven guilty is a bedrock of the American justice system, but President Donald Trump has bastardized the expression for his own personal gains. We’ve now seen it again in the case of the torturing and killing of journalist Jamal Khashoggi at the hands of Saudi officials in Turkey. Trump’s weak response to this major incident is probably a combination of factors – Trump has strong business ties to Saudi Arabia (and left them off his Muslim travel ban despite being primary players in terrorism) and he doesn’t care for journalists in the first place. Ick. The thing is, there really aren’t a lot of alternative theories as to what happened in the consulate. Either he was “accidentally” killed while being tortured without Saudi leaders’ knowledge, or the Saudi leaders did in fact order this to happen on purpose. Either way, it’s not the kind of act that Trump should be shrugging his shoulders at. The Trump administration seems fine with the idea of Saudi Arabia investigating itself on this matter, which leads to the point that there is no proving someone guilty when the system makes it that easy to escape culpability. Saudi will remain “innocent,” with help from a complicit United States, because ”guilty” is not a realistic outcome. The same goes for the aforementioned saga with Kavanaugh. Trump says the process showed he was “innocent all the way,” even though there was no trial or anything meant to vindicate Kavanaugh aside from muddying the facts and confusing everyone. Again, there were no means to prove Kavanaugh guilty, so if that’s the standard, he remains innocent indefinitely. Presumably, Trump is turning to this mantra knowing full well that he’s faced dozens if not hundreds of allegations of criminal wrongdoing himself. He benefits from a mentality where you don’t consider the totality of his actions and instead have to continuously grant him a pass because courts haven’t convicted him. Never mind that the rich often seem to escape criminal repercussions, and that the president in particular enjoys certain prosecutorial immunities as president and just confirmed a Supreme Court justice who thinks a sitting president cannot be indicted. Trump is “innocent” until you nail him for something he’s quite confident he’ll never be nailed for. It’s not like Trump applies the same “innocent until proven guilty” standard to people he’s not trying to protect. He leads his supporters in chants of “lock her up” about Hillary Clinton, he called for James Comey to go to jail and he called for the execution of teens of color in the Central Park Five cases who were later exonerated. 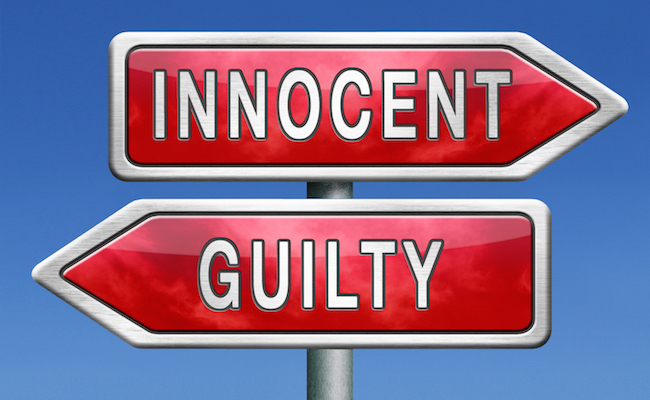 Innocent until proven guilty is an important ideal within the justice system. It’s wrong for the state to lock up people without sufficient evidence. As for making decisions outside of the justice system – like deciding who gets to be one of a handful of Supreme Court justices or condemning Saudi Arabia for a clear pattern of human rights abuses – we don’t and shouldn’t need a literal guilty verdict to form opinions based on the evidence in front of us. Chrissie: "The founding fathers established the Constitution to do just two things: 1) Establish a federal government for the United States of America. 2) Delegate to the federal government certain, limited (and enumerated) powers." While it's undeniable that the 14th amendment to the US Constitution guarantees to every person, aliens included, âequal protection under the law,â the concept of "innocent until proven guilty" is not the "core basis" of our constitution. It IS, however, "one of most sacred principles in the American criminal justice system, holding that a defendant is innocent until proven guilty. In other words, the prosecution must prove, beyond a reasonable doubt, each essential element of the crime charged." The left didn't bat an eye when four Americans were murdered by Muslim terrorists in Benghazi. It was swept under the rug by the corrupt Obama administration.